Last week I wrote about credit card technology, in particular the “chip and PIN” or “smart” cards that Europeans have been using for decades. I said that although the technology used by European (and Canadian, it turns out) cards is unquestionably more sophisticated than the dumb old plastic we simple Americans carry, it is not particularly “smart.” The only meaningful advantage is in fighting fraud, but that problem has such a tiny economic impact that it is hard to imagine how upgrading from our current swiping system could possibly make sense. Indeed, I still do not understand how adopting chip and PIN makes economic sense outside the USA. I can understand it making psychological sense. Everybody seems to have an irrationally exaggerated fear of credit card fraud. And there is no discounting the cool factor: the natural human attraction to new technology. Speaking of which, two readers pointed me to a New York Times blog entry posted two days later on even higher tech cards now in the pipeline. 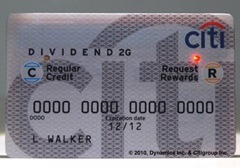 These new cards, now being tested by Citi, communicate with the outside world via the good old magnetic stripe reader, but have chips inside as well as buttons and displays. They are the same size as conventional cards and run on a battery that should last well past the normal card expiration date. Cool. 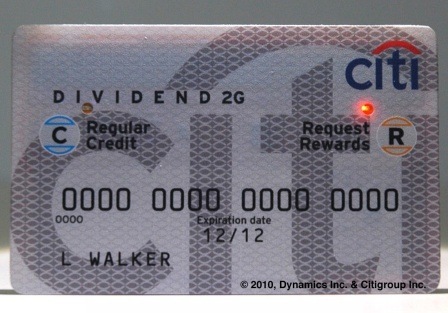 How cool is the Citi card? I’m not sure. You could just as easily announce in a clear voice that “I am paying for this with points” as you swipe your card and then apply the points to your balance when you pay the bill at the end of the month. Still, the card has these cool little lights on it. And buttons. I think it tells us a lot that the first implementation of this undoubtedly nifty technology has so little practical benefit. The company that developed it, Dynamics Inc., has another product that sounds like an anti-fraud killer app. Not only does a user have to key in a PIN to get the magnetic strip to work, the account number is not otherwise visible on the front. Too bad nobody really cares. A more attractive application is the multi-account card. In theory, you would only need one physical card which, by pressing a few buttons, could be swiped for any of your many accounts. That is actually useful, but I foresee two big issues. Second, although reducing four or five cards down to one is nice, it is far short of the benefit of reducing four or five cards down to zero. That is the promise of so-called electronic wallet schemes, and although nobody has quite worked out the details yet, I think this is the way the world is going. After all, carrying these little plastic tokens representing each of our accounts is a bit archaic. All we need is some way to give the right account numbers and codes to the merchant at check-out. If only we could get everybody to carry small multi-band radio transmitters. Ideally, those transmitters would carry a chip with a unique identification code and would be capable of running simple computer programs. I am not ready to pronounce this technology dead. A card with buttons, lights, a display, and a dynamic magnetic strip really is cool. A friend of mine who works with similar things tells me that it should cost $6-$8 to make. If Citi offers it to customers for $10, I am sure they will sell more than a few. And I could see banks offering a selectable credit/debit card for a similar amount and getting a few takers. But this will be a niche market for nifty coolness, not a game-changing improvement in how cards work. Of course, simple coolness can go a long way. Just ask Steve Jobs. I’m waiting for this to evolve into more of a Tomagotchi sort of thing where I have to press the buttons to feed it and gain rewards. Maybe one day I’ll be able to use these rewards or better my own money at the credit card app store to buy my credit pet a new bed or outfit. Then it’ll be really hard to justify carrying featureless cash. Just imbed a chip into our thumb when we are born. Or forehead for those born without thumbs. This chip will be scanned to pay for everything via a system of credits, which will be increased when we are “paid” for work. Are we really all that far off? Because Chip & PIN is now a defacto global standard of processing payment, that’s why. It makes economical sense to just go with the flow as everybody else instead of wasting money trying new things that nobody else is gonna adopt. More money is to be made by adopting something that’s already becoming a global standard; the international market is much larger than the US market alone. There’s actually a terminology for this: “the Galapagos Effect.” It’s term coined by economical analysts where one form of technology takes a different path of evolution apart from the global market. It was a dilemma faced by Japanese cell phone makers; they have a top edge leading technology on those cell phones years before that would’ve put the iPhone to shame, but they couldn’t sell it outside of Japan because everybody else was using GSM while Japan used its own proprietary cellular standard that was incompatible with the rest of the world. Japan missed that chance to rule the phone market and they are stuck with a multi-billion yen invested in their own proprietary standard that they can’t shed off easily, isolated itself from the rest of the world. The Galapagos Effect for the US are credit cards. Everybody else is moving toward the global standard of Chip and PIN, but for whatever reason the US sticks behind the magnetic stripe, isolating itself from the rest of the world. @Adam: You are talking about RDIF tags. Dogs and cats already have them. We could have them too, but then you could be monitored. @Frank: Really these technologies are already dead in Europe. People are buying stuff with their phone. Why lug around a bunch of cards when they all can be on your phone? Ken, The US is still the largest marketplace with the most transactions in number and dollar value. About 40% of the transactions are here in USA. So it makes more sense for the other markets to do what we do as far as efficiency. And its not “everybody else” versus the USA. Its the USA, Europe, Asia, Canada & Latin America all making up separate markets. I don’t see anything in the articles saying these chips are popular in Asia or Latin America. I’m going to go out on a limb and suggest that Frank was referring to something specific here. I’m not sure what, but maybe a quick Internet search on my smartphone will give me a clue. Even though 40% of transactions are in the US, those transactions mainly done by Americans living inside of the US doing transactions in the US. In contrast, for Europe, you have French living in France going to Belgium for the weekend, or Germans going to UK for a holiday. Different countries just a few hours away means if one country makes the switch, the next neighbor has to follow suit. And another, and another. That’s where the difference is between US and Europe. To put it to perspective, it’s like California introducing its own legislation that all banks doing business in California must provide Chip & PIN. California does so, and then Nevada and Arizona follows suit. And as for Latin America and Asia, yes they’ve already made the switch. In fact, my colleague in Japan has the swiss-army knife of credit cards: it has a magnetic stripe on the back, a chip and pin on the front, and the contactless chip inside the card so it can be processed three ways, anywhere in the world. He can swipe & sign with that card in the US, use the Chip & PIN in Europe, and use the contactless for trains in Japan. One card does all that. Why can’t we have it? If it were given to me as an payable option, I’d be more than happy to pay $20 for such an all inclusive hybrid card instead of this stupid Citibank “two-gee” marketing gimmick that no other country is gonna adopt.